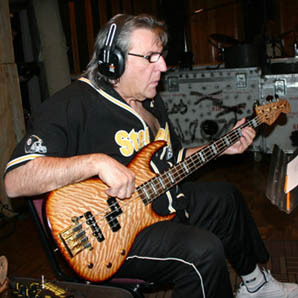 Bob Babbitt, the bass guitarist who provided the driving, iconic bass lines for "Cool Jerk," "Band of Gold," "The Tears of a Clown," and scores of other hits, died yesterday of brain cancer. He was 74. Born Robert Kreinar in Pittsburgh on November 26, 1937, Babbitt was a member of Motown's house band, The Funk Brothers, from 1966 to 1972. He alternated with the legendary James Jamerson on most of the label's hits. Babbitt's legendary performances include "Cool Jerk" by The Capitols; "Signed, Sealed, Delivered I'm Yours" by Stevie Wonder; "War" by Edwin Starr; "The Tears of a Clown" by Smokey Robinson & the Miracles; "Mercy Mercy Me (The Ecology)" and "Inner City Blues" by Marvin Gaye; "Band of Gold" by Freda Payne; "Ball of Confusion (That's What the World Is Today)" and "Just My Imagination (Running Away With Me)" by The Temptations. One of the most sought-after session musicians in the industry, Babbitt played on hundreds of recordings for scores of stars. His distinctive stylings helped to make many of those songs classic hits. A small sample includes "Little Town Flirt" by Del Shannon; "I Got a Name" by Jim Croce; "Midnight Train to Georgia" by Gladys Knight & the Pips; "Scorpio" by Dennis Coffey & the Detroit Guitar Band; and "(The) Rubberband Man" by The Spinners. His bass line in "Scorpio" was the standard by which bass players were judged in the 70s; those who couldn't duplicate Babbitt's performance didn't get the gig. Babbitt is featured in the 2002 film "Standing in the Shadows of Motown," which documented the Funk Brothers' previously unheralded contribution to the label's success. He also performed on Phil Collins' 2010 Motown tribute album, "Going Back." In March, 2011 he appeared onstage in an episode of American Idol, backing up Jacob Lusk's performance of "You're All I Need To Get By" for the show's "Motown Week." A full biography of Babbitt is available on his web site. As a kid growing up in Homestead, PA in the 60s and 70s, Babbitt was an integral part of my daily existence, even though I didn't learn of his contributions- let alone his name- until decades later. Motown was everywhere then- and for me, it still is. I don't think I've gone more than two or three days without hearing something with a Babbitt bass line since I bought "Cool Jerk" at the little record store on Eighth Avenue in July '66. Thanks, Bob, for all the memories.